This step by step diy project is about queen size storage bed frame plans. If you want to build a learn more about building a queen size storage bed with a nice design, pay attention to this project. Follow the instructions and pay attention to the diagrams and build the wooden bed in just one weekend, even if you are a beginner when it comes to woodworking. Take a look over the rest of the project, to learn more about building furniture by yourself. You should always plan everything from the very beginning, in order to prevent costly mistakes and to save time. Taking into account the basic design, this bed frame can match the style of any home. Mark the cut lines on the slats before making the cuts and use a jigsaw to get the job done. If you are looking for other designs or sizes, you should check out the rest of the bed frame plans. The first step of the woodworking project is to build the footboard panel. Build the vertical components out of 2×6 lumber and the cleats out of 1×6 lumber. Lay the vertical slats on a level surface and attach the cleats. Align the edges with attention and insert 1 1/4″ brad nails. Add glue to the joints and remove the excess with a damp cloth. Drill pocket holes at both ends of the cleats and insert 1 1/4″ screws into the legs. Center the panel to the legs and leave no gaps between the components. Make sure the corners are right-angled before inserting the screws. 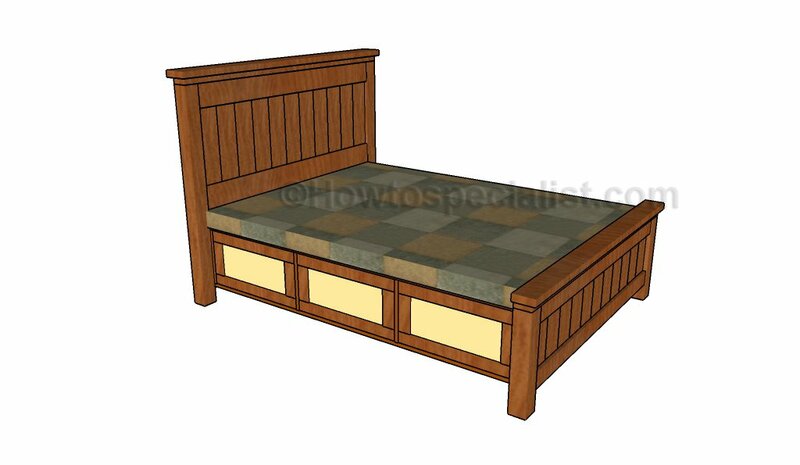 Fit the 2×4 trim to the footboard, as shown in the diagram. Align the edges, drill pilot holes and insert 2 1/2′ screws. Add glue to the joints and remove the excess with a damp cloth. Build the top trim out of 2×6 lumber, but adjust the width to 4 1/2″. Center the trim to the footboard and secure it into place using glue and 2 1/2″ screws. Insert the screws after drilling the pilot holes. Build the headboard panel in the same manner described above, just make sure you cut the components at the right size. Use 1×6 slats for the cleats and 2×6 slats for the panel vertical components. Drill pocket holes at both ends of the horizontal cleats and insert 1 1/4″ screws into the legs. Add glue to the joints and make sure the corners are right-angled. After assembling the headboard, you need to attach the 2×4 supports to the bottom of the headboard. Drill pocket holes at both ends of the supports and secure them into place using 2 1/2″ screws. Smart Tip: Leave no gaps between the components. Next, fit the 2×4 and 2×6 trims to the top of the headboard. Center the trims into place. Drill pilot holes and insert 2 1/2″ screws to lock everything together tightly. Building the storage units is a straight forward process, as you need to build the components out of 3/4″ plywood. Smooth the edges with fine-grit sandpaper and dill pocket holes at both ends of the vertical partitions. Align the edges with attention and join the components together by inserting 1 1/4″ screws. Smart Tip: Add glue to the joints and remove the excess with a damp cloth. Build the back of the storage units out of 3/4″ plywood. Set the component to the frame and secure it into place using 1 1/4″ screws, after drilling pilot holes. Align the edges with great care and leave no gaps between the components. Fit the storage units to the bed frame. Fit the plywood boxes between the headboard and the footboard and lock them into place with 2 1/2″ galvanized screws. Use a spirit level to check if the boxes are horizontal. Drill pilot holes before inserting the screws, to prevent the wood from splitting. In addition, use a carpentry square to check if the corners are right-angled. Continue the project by assembling the middle frame. Build the components out of 2×4 lumber. Drill pilot holes through the side components and insert 2 1/2″ screws into the middle supports. Make sure the corners are square, the edges flush and the supports equally-spaced. Fit the frame to the bed frame and place it 3/4″ under the top edges of the side storage units. Drill pilot holes through the side components of the middle frame and insert 2″ screws into the back of the storage units. Next, attach the 3/4″ plywood sheet to the middle frame, as described in the diagram. Drill pilot holes and secure the component to the underneath frame using 1 1/4″ screws. Build the drawers for the queen size storage bed using 1×10 lumber. Drill pocket holes at both ends of the side components and insert 1 1/4″ screws into the perpendicular components. Make sure the corners are right-angled and add glue to the joints. Build the bottom of the drawer out of 1/4″ plywood. Align the edges with great care and secure the component into place using 1 1/4″ brad nails. Leave no gaps between the components and add glue to enhance the bond. Build the front face of the drawer out of 3/4″ plywood. Attach the component to the drawer and insert 1 1/4″ screws from the inside. Add glue to the joints and drill pilot holes to prevent the wood from splitting. Fit 1×3 trims (1/4″ thick) to the face of the drawers, in order to enhance their look. Add glue to the joints and remove the excess with a damp cloth. Fit the drawers to the openings by using slides. Fit the handles to the face of the drawers. This farmhouse queen size storage bed frame will add value to any room and help you organize everything easily. Make sure you select a color that blends in nicely with the rest of the items in the room, otherwise the end result won’t raise up to your expectations. Smart tip: Apply a few coats of stain or exterior paint to the components, in order to protect them from decay and water damage. Check out the rest of the indoor furniture plans featured on our website. Thank you for reading our project about queen size storage bed plans and we recommend you to check out the rest of the projects. Don’t forget to SHARE and LIKE our projects with your friends, by using the social media widgets, if you want to help us keep adding free woodworking plans. None has built this project till now. I’m loving this idea of storage under the bed. But my question is do i need the head board if I use this plan?.id like to stick with the king bed plan but downsize it to a queen. You need some kind of headboard to support the storage units. I am digging this and want to make! is it possible to make this mobile (on casters maybe) because I love to rearrange my furniture at least once a month for cleaning. thank you much in advance. Yes, you can use some caster wheels with lock mechanism.